In the wake of low self-esteem comes fear and anxiety. To improve your self-esteem you have to challenge your fears. Do scary stuff that makes you feel in control. I have always had fear of heights. Standing on the two first steps of a ladder was enough for me to feel dizzy; it was even problematic for me to stand on a chair. I beat the fear by forcing myself to challenge heights. I started slow to get used to the heights. If I climbed a tree I would keep going until I felt the fear in my stomach and then I climbed one step further and froze on the spot. My heart was beating in my throat and I almost peed my pants. I would sit there waiting and waiting and waiting. I kept waiting until I got used to the situation and my heartbeat got normal. I repeated this process again and again and again. Face the fears you know. Face the things you know you are scared of and do it slowly like I climbed the tree. This way you push your limits instead of transcending them. Do dangerous things. Do activities that you do not face in your everyday life. E.g. 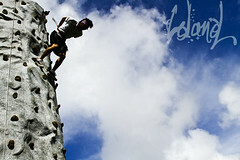 climb a mountain site; abseil a house; go parachuting; dive with piranhas etc. This way you will learn to love fear and if you love fear you will be comfortable with fear. What I love about fear is the rush I get. The feeling is hard to describe but it makes me feel invincible and high. The body produce stress hormones that make you feel excited and after doing something dangerous you feel better than ever. To be in control you have to choose the fears to face, do not wait for them to choose you! If you want to keep your body tuned to overcome the daily challenges successfully, then make your exercise schedule comply with the rules of thumb I have set up below. Keep in mind that vacuuming, taking the stairs or working is not exercise. I agree that doing your daily activities is much better than sitting in your armchair doing nothing, but it is just not enough if you want a body for success. If you want to stay in shape and be vital then you need to exercise all your life; make exercise part of your lifestyle. You need to exercise all aspects of your body. Focus each training pass on cardio workout, strength training or stretching. Do specialised training (e.g. swimming technique or rowing or martial arts) Specialised training will help you setting and reaching goals. Be consistent – attend training even if you do not feel up to it. Usually you will feel better during or after training. Read and philosophise to exercise your brain. I attend swimming twice a week and go to the fitness centre as often as possible and I run 7 km once a week. I can recommend the fitness centre because it offers different work out classes that makes it easy to vary training. If you are thinking: “I do not have time for all that” or “I am to tired to do all that exercise” – then it is time for you to get started because you will realise that you will get the time and energy to do it. You will feel more energetic and efficient in your daily routines. Exercise prevents heart disorders, stress, workplace injuries and mental disorders. The world is dynamic and never stands still. Even when if you try to stand still your body functions will still be working. Your heart beats, your blood flows and your lungs breathe. Take a look at a river it looks the same on a distance, but close up you see how the current makes the water flow and makes small changes all the time. The river is in constant flow and constant change and is never the same. Start with small and easy processes like dressing or maybe cooking simple meals. The most important thing is to remember that you have to be in constant movement and never stop. The trick is to visualise your next step while doing the preceding step. E.g. while putting on your t-shirt you decide to put on your jeans after that; visualise yourself putting on the jeans and when you finish putting on the t-shirt you continue the flow reaching for the jeans. As this process starts, like you visualised, you start thinking about the next step. Continue until you have finished dressing. This is also a great way to tidy up. It is quite fun and you do not have to hurry; actually you have to do it slower; slow enough to keep a steady flow that allows you to think about the next step. The great thing is that in spite of the slower pace you will finish faster than normal. You will also feel relaxed and energetic; you will be happy. Would you like to know more about flow?